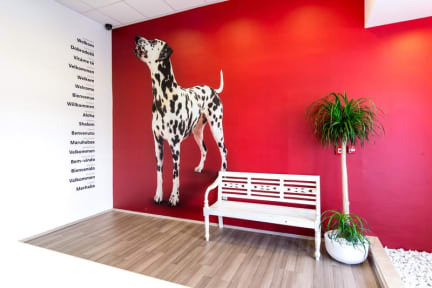 If you’re looking for a fun, comfortable and friendly place to stay then look no further: 101 Dalmatian is the perfect place for you, whether you are a student backpacker, a young family or a more mature couple looking for a relaxing stay. Our hostel has exactly 101 beds. Each bed represents an island. The picture of the island is located on each bed wall providing some interesting facts. You can also read a few facts about the islands such as: population, latitude and longitude or see the island’s #hashtag#. We offer a total of 19 rooms, each with one shower room and one restroom, to avoid waiting, which will make your stay comfortable. All rooms and dormitories are air-conditioned and provide a seating area. Our hostel and our staff will offer enjoyable homey atmosphere. We are always ready to share all the information that you need, as well as our good mood. Cancellation policy: 72 h before arrival date. In case of a late cancellation or No Show, you will be charged the first night of your stay. Non refundable rates are charged immediately after reservation and you pay for occupancy tax on „check in“. Taxes not included - occupancy tax 8.00 HRK per person per stay. In private rooms pets are welcome to stay, free of charge. Very good hostel. I recommend. Very good location. Awesome staff. Big Up ! Really good hostel. Very clean. Place to lock away valuables. The location is far out but there is a bus stop a few minutes walk away from the hostel so it worked out fine. Great hostel. Very clean with a nice common area. Only downside is that it is a bit far from the downtown area. Would stay again. We really enjoyed our stay here and extended our stay of 1 night to 5 nights. The rooms and bathrooms were really clean. They have big lockers in each room with a key. You are provided with towels and bedding. There is no kitchen but they do have a fridge in the hang out room and Netflix on the television. It is a 5 minute walk away from a supermarket complex, a bar and a restaurant. The only downfall is, that it takes a 10/15 minute drive to get to the centre of split or you can catch a bus. Hostel description is inaccurate. There is no kitchen, only a fridge and microwave. The laundry is a professional laundromat who charge €7 per person and were fully booked for the three days we were there. The rooms are large and clean but is a long 4km walk from town. Luckily there is a bus that stops just outside the hostel. Staff could’ve been more welcoming.